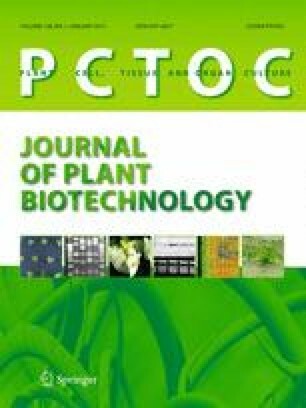 We evaluated the ploidy levels and tissue culture responses of 16 Japanese Miscanthus accessions, which are registered and vegetatively maintained in the National Agriculture and Food Research Organization GeneBank, Japan, to screen suitable genotypes for the molecular breeding of Miscanthus species. A ploidy analysis showed that most M. sinensis and M. sinensis var. condensatus (var. condensatus) were putative diploids, but one accession identified as M. sinensis was unexpectedly a putative tetraploid. Additionally, M. sacchariflorus and its hybrid accessions were putative tetraploids. The deoxyribonucleic acid levels in var. condensatus were significantly higher than those in the diploid M. sinensis. Of the accessions, 10, including M. sinensis and var. condensatus, could induce plant regenerable embryogenic calli from apical meristems. We selected three of these M. sinensis accessions for further experiments because their calli growth rates were faster than those of the var. condensatus accessions. Tissue culture experiments with the selected accessions indicated that the frequencies of callus and green shoot formation strongly correlated with genotype. The broad-sense heritabilities of the embryogenic callus and green shoot formation frequencies in the selected accessions were 0.75 and 0.65, respectively, indicating that the cultures’ responses were mainly controlled by genetic factors. Thus, we further selected one accession that had the highest efficiencies in callus and green shoot formation, and we observed that light during callus culturing significantly inhibited calli growth, but promoted plant regeneration from calli in the selected accession. We express our gratitude to the NARO GeneBank, Japan, for providing the Miscanthus accessions used in this study. We would like to thank Mr. Y. Nishimura (Chiba Industrial Technology Research Institute) and Dr. K. Sugawara (Institute of Livestock and Grassland Science, NARO) for their support in taking SEM-images. We thank Ms. S. Sasaki (Institute of Livestock and Grassland Science, NARO) for her prominent assistance in tissue culture. We thank Ms. L. J. Ackley (Joytalk Co., Ltd.) for supporting and giving us advice on manuscript writing. Conceived the experiments: WT, and TT. Designed the experiments: WT, ST, ME, and MK. Conducted the experiments: WT, ST, and ME. Analyzed the data: WT. Contributed materials: WT, ST, and MK. Wrote the paper: WT.